In Episode 130 of GatherGeeks, David Adler, C.E.O. 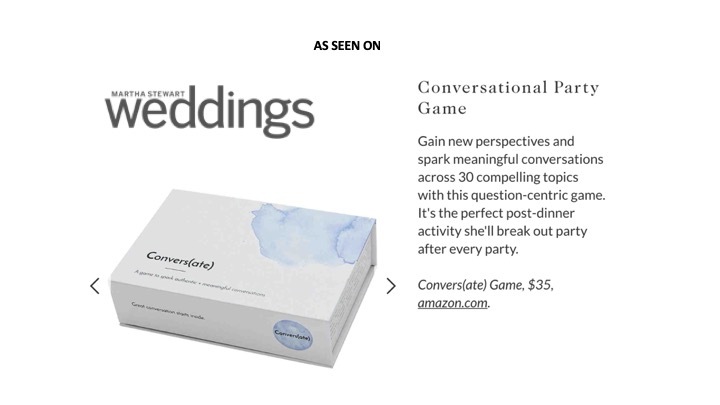 of BizBash, and Beth Kormanik, editor in chief of BizBash, hear from Taylor Buonocore Guthrie and Mollie Kinsman Khine, the team behind Convers(ate), a game that's intended to spark meaningful dialogue. The group discusses the concept of a Jeffersonian Dinner and how it can be an effective tool for business events. They share what makes a good icebreaker, how to encourage vulnerability, the importance of human connection, and more. Sponsored by Hilton Meetings & Events. Taylor + Mollie share perspectives on questions like: What is a Jeffersonian Dinner? Being a great host often means having a clean and comfortable home, pulling off a delicious meal, and keeping the wine flowing. But as any truly great host will tell you, it’s about much more than food and wine. What makes a dinner party one to truly cherish is the conversation and the experience of being at your table. Small talk only gets you so far. If you want to improve your career, your relationships, and your life, you have to move past small talk to something deeper. Today we interview two experts on the art of meaningful conversation. Community dinner events bring people from all walks of life together to share food and engage in the forgotten art of face-to-face conversation. Have you ever had a brief or chance interaction that turned into a lasting relationship? Why do some connections end where they began, while others last for years? What helps transform a single interaction into a lasting relationship? These ideas fascinate me, and I’ve spent the past decade informally studying these questions. What I’ve experienced and observed is that the defining factor is meaningful connection. Like planning a great travel itinerary, you can plan ways to bring the spirit of travel into your every day. To tap into the curiosity, open mindedness, and eagerness that defines the travel experience. Convers(ate) was selected as a "Project We Love" by Kickstarter staff.